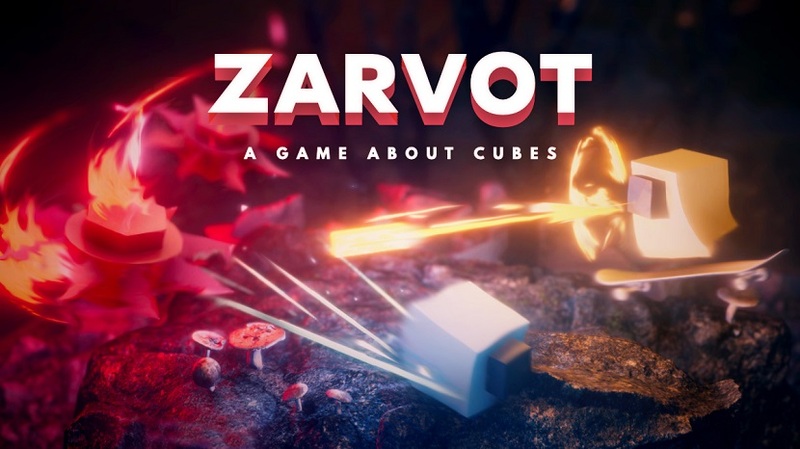 What it doesn’t tell you is that Zarvot is mostly an isometric shooter where you play as a cube attacking other enemies (a lot of which are kind of cube-shaped as well) but it also has a strangely intriguing single player story mode, which involves more than shooting. The story is told very well, with the main character Charcoal, accompanied by his good friend Mustard, trying to put together the ultimate present for Red, one of their other friends. Initially this just involves you tracking down a banana, which then ends up attacking you. Yeah, it’s that kind of game. But what I think is genuinely brilliant is that the story grounds itself perfectly within it’s own world. So although many elements of it come across as silly and surreal, there’s also genuine emotion and pathos. And for those of you wondering how you can craft a story around an isometric shooter, there is also some platforming involved, some exploration, and even the occasional vehicle level, just to confuse you totally. So it’s a game that’s very hard to categorise. Which I really enjoyed. Yes, the vast majority of the levels are corridors leading you to small arenas where you have to deal with a wave of enemies before you can move on, and then another corridor to the next arena etc, but it’s done in such a way that it kept me genuinely interested and enthralled throughout my playtime. The graphics are lovely – with a distinct style, as these brightly coloured cubes exist within a realistic-looking world, and the whole thing makes perfect sense while you are playing it. But with this game being a shooter and a platformer, the controls are key. And actually, by and large, these are very well implemented. They are tight, intuitive and generally well designed – although the mashing of all four face buttons to use your chomp attack (when your chomp-meter is full) is not the best. I’d have much preferred a dedicated chomp button. It can get very busy as well when you have waves of flying enemies that you have to jump and shoot at, but I never really felt I died because of bad controls, more because of my own lack of gaming skill, so I didn’t truly blame the controls at any point. The sound effects are pretty repetitious (as is often the case with shooters – after all, one bullet sounds a lot like the twenty-three others you are firing in quick succession) and the music is non-intrusive, so while I’m not going to spend the day whistling the music from the game, it’s still a good accompaniment to it, so no complaints here. There is also an arcade mode where you can take on arenas of enemies, beat five waves and win. These are fun, though they didn’t really have the longevity for me, I was having much more fun with the story mode than these arcade levels, though they may well tempt me back for a quick fix of the game every now and then. And then there is multiplayer. With a multitude of options (including one Switch-exclusive mode where one of you plays as the giant banana boss) and only one joy-con required for each player, this may well be one of those games that gets wheeled out whenever people want to have a quick, fun game against each other. I can definitely see it being a party favourite, and look forward to trying it out with more than one other person soon. Apart from my minor niggle about the controls, this has been a glowing review – so is there anything else I didn’t like about the game? In all honesty, not really. Some of the platforming in the story mode does get a bit awkward on some later levels, and by it’s very nature it can start to get repetitive if you keep dying half-way through a level, as you’ll end up facing the same waves of enemies again and again. It’s what I like to call a pick up and play game. It’s not a game I’d spend hours on hours in an extended play session on, but if I’ve got half an hour to kill and the switch in my hands, then it’s highly likely I’d fire up Zarvot for a bit of cube-on-cube action. And that’s a sentence I never thought I’d say! This is definitely a worthwhile game to add to your Nintendo Switch collection. Fun on the move and amazing multiplayer on the big screen, I urge you to pick it up. You won’t regret it. Playstation Classic – The Full Line up Revealed!